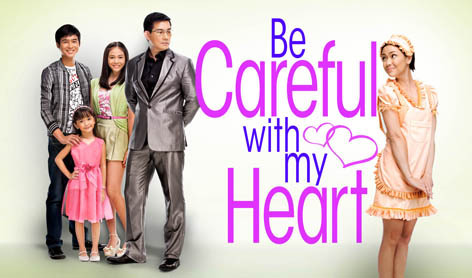 I am an avid watcher of the teleserye “Be Careful With My Heart.” Not only does it have entertainment value, it also highlight several positive virtues we rarely see or that are fading amongst Filipino families. It’s supposed to be the story of a poor lass from the province, Maya dela Rosa, who initially planned to go abroad to help the family financially after her elder sister met an accident and their house is being foreclosed due to huge debt. Unfortunately she fell prey to an illegal recruiter and thus was unable to leave the country. She found herself job-hopping until by accident she came across Mr Richard Lim, a widower with three children, and the proprietor of Lim Aviation. She worked as a nanny in exchange for a scholarship so she could pursue her dream of being a flight attendant. The title by itself gives the viewer the idea that this show is about a blossoming intimacy between Mr Lim and Maya, a widower and an innocent lass who never had a relationship beforehand. I thought this was adapted from the show The Nanny where the plot was quite similar. There are several subplots, yet the subplots have their own unique story to tell, moral values to share, life experiences to teach, all of which are equally entertaining and socially relevant. One particular subplot that got me to blog about the show was the responsibility of Mr Lim aka “Ser Chief” as a father to his three children, performing such herculean task alone as his wife died prematurely, and his kids already growing up, (now on their adolescent age, except the youngest). The tv show clearly emphasizes the importance of open communication between the father and his kids. Despite being a single parent with a large company to manage, he never forgets his duty as their father and takes time to listen and address the concerns of each of his children. Sometimes, even to the extent of canceling his appointments in order to attend to his kid’s needs at those precious times. When Luke Andrew, his eldest, formally tied a relationship with his chum Joey after being crowned Prom King and Queen, Luke disclosed everything to his father about it. He understood his son, as he too had his first girlfriend at the same age. Luke every now and then occasionally ask tips from his father or his younger sibling Nikki Grace how to appease Joey. After informing his father, Luke was planning to formally inform also Joey’s strict mother, Grace, about their relationship, but was daunted. He was then planning a way of notifying in the soonest time, while he is gathering his courage to do so. Joey however shared his relationship status with a cousin, who later posted about it in his Facebook account. Joey’s mother, Grace, discovered about the relationship and got mad. Joey then told Luke about their problem. Luke was already decided to go to Grace on the following day to formally introduce himself as Joey’s boyfriend, to talk to her and explain that he did not intentionally want to hide about his and Joey’s relationship. However, Joey and Grace were already on the way to the Lim’s residence to talk. Ser Chief, who was supposed to be on a date with Maya, had to cancel in order to support his son. Ser Chief, Luke, Grace and Joey finally settled things, the young lovers promising to still be on focus with their studies and not do anything stupid that will destroy the trust of their parents. This was such a beautiful episode for me and I commend the script writers for incorporating this segment. It emphasizes the big role of parents still during the adolescent age of their kids, guide them especially on tasks that may seem too much of a burden, in order to avoid mishaps in their kid’s lives. While the teenager at this stage struggle to be more independent, the parents role should not be reduced. Though not controlling, parents should be willing to listen, and give sound advices as teenagers have yet to learn so much of life. The beauty of this episode also shows that being a single parent is not an excuse for not properly guiding your own kids if you indeed value your family and want your kids to grow as responsible ones. I earlier on tweeted that it was unfortunate that many working parents and studying teenagers were not able to watch it as the show is pitted on a midday time slot. It would have been a good teaching experience, an eye opener for both parents and teenagers in order to avoid conflicts between them. In the Philippines in this times, because parents had to make ends meet to be able to provide for the needs of the family, many of the families have either one or both absentee parent/s as he/they has/have to work abroad. The children are not left under the care of the parents’ siblings, or the children’s grandparents, who as well have other kids and family members to attend to. The adolescents’ concerns are not attended to fully, there are no parents to listen to their children’s problems. The parents use singleness as an excuse why they can’t focus on their children’s other needs and concerns, as long as their kids have food to eat, clothes to wear, gadgets to display. This is unfortunate as unguided adolescents may end up listening more to their peers than their parents. That adolescent is lucky if his peers’s influence is towards his own good. But if the peer is also on the exploration side, seeking dangerous thrills and doing risky behaviors, then that poses a very humongous problem.